Mature green spikes with 1 or 2 berries in the spike starting to yellow are harvested for the preparation of black pepper. The following precautions should be taken during harvesting and threshing to get a high yield of good quality black pepper. Start harvesting when one or two berries in the spikes turn yellow. Follow a selective harvesting method (preferably 3-4 harvests) to collect only fully matured spikes. Care should be taken to avoid damage to the plants during harvest. If spikes fall on ground during harvesting, they should be collected and washed well. Threshing should be on clean floors, not on dirt floors or floors smeared with cow dung, soil, etc. Where possible, mechanical threshers should be used. Pepper spikes that have accumulated dirt, dust etc. should be washed before threshing. Use plastic crates or clean baskets or bags for handling pepper. Spikes with two or three deep yellow or red berries may be harvested for making white pepper. Under-ripe spikes or immature berries should not be used for this purpose, as the conversion rate will be very low and the quality will be poor. Spikes affected by Black Berry Disease or Fungal Pollu are also not suitable for preparing white pepper. It may be noted that those spikes picked in the first and last rounds of harvest generally show different stages of maturity and do not give a satisfactory product. In Sri Lanka, spikes are kept for 2-3 days after harvest, in order to increase the number of ripened berries to be processed. Berries that have been separated from spikes by threshing soon after harvest may be sieved to remove the smaller and immature ones. These are put in gunny (jute) bags (Fig below) that are then kept immersed in a flowing river or stream or in dams for retting. Alternately high-density polyethylene (HDPE) tanks or cement tanks connected with pipes to let in clean water and let out waste water may be used (Fig below) to ret the pericarp of the berries. The Central Food Technological Research Institute (CFTRI), Mysore in India has come out with a different method for preparing white pepper. Fully mature, but unripe berries are boiled in water for 10-15 minutes to soften the pericarp. After cooling, the skin is rubbed off either manually or mechanically, and berries are washed and sun dried to obtain white pepper. Since no retting operation is involved, the product will be free from any unpleasant odour. However, the powder made by this process is light brown in colour due to the gelatinisation of starch, in contrast to the white powder obtained by the traditional method. After 10-14 days (in Malaysia, or in India about 10 days and in Sri Lanka 6-7 days) the bags are taken out and the berries trampled thoroughly and washed several times to remove the decayed pericarp. In Malaysia, rattan baskets are used to wash berries, as water and refuse can pass through the small holes of the basket. The resulting clean, white pepper corns are sun dried as in the case of black pepper (Fig) but drying is quicker than for black pepper and usually takes only about three days. The rate of recovery for white pepper is about 25% of the weight of ripe berries. Mature green to yellow pepper berries may also be run through a mechanical decorticator to remove much of the pericarp. The berries are then soaked in clean water to soften the remaining pericarp and mucilage. The pepper is then washed and the resulting white pepper berries are dried. This method, as recommended by the Indonesian Agricultural Postharvest Research Institute, allows for a much reduced period of soaking and can produce white pepper without the off-flavours that may develop from contamination during prolonged soaking. There is another kind of white pepper produced by mechanical decortication of the outer skin of black pepper. This is generally done when white pepper is in short supply, as a stop gap measure. The appearance of the decorticated kernel is inferior to the traditionally prepared white pepper, but it gives a somewhat satisfactory colour when ground. The milling operation requires considerable skill to avoid excessive loss of volatile oils. 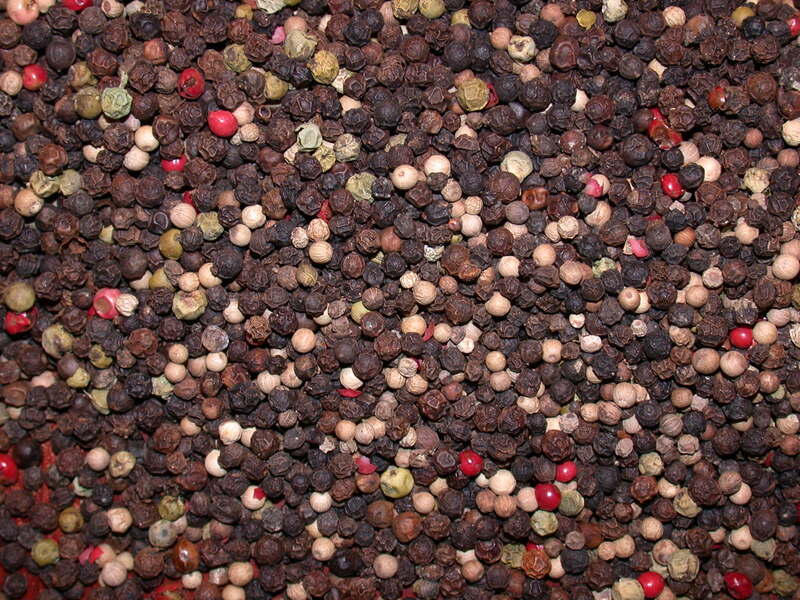 Low temperature cryogenic grinders will overcome this problem in both black pepper and white pepper products. Due to the advantage of two pepper flowering seasons in Sri Lanka, availability of fresh harvested pepper is spread over about seven months of a year, unlike in other producing countries. Hence various products such as black pepper, white pepper, canned pepper, dehydrated pepper etc. can be prepared fresh over a longer period.